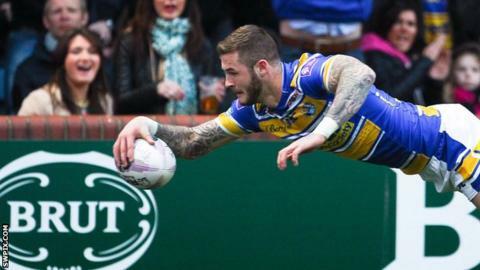 Prop Jamie Peacock has described his Leeds team-mate Zak Hardaker as the best defensive full-back in the world. While Hardaker has gained 1,696 metres this term, more than anyone in Super League so far, it is his role in a Leeds defence that has conceded just 94 points in 11 league matches which Peacock is most impressed by. "He saves us that many tries it's not funny," said Peacock. "Defensively, there is not a better full-back in the world." Talking to BBC's Super League Show, former England and Great Britain captain Peacock continued: "His defence this year has been unbelievable. "He is better than anyone down in the NRL." Hardaker's attacking qualities also helped the Rhinos move top of Super League again, with his fine individual effort - dummying through Wigan's resistance before finishing brilliantly in the corner - the highlight of their 28-12 win against last season's champions. Having started his Rhinos career on the wing in 2011, former Featherstone Rovers man Hardaker has played a number positions for the Headingley club, including centre and stand-off, but has predominantly featured as a full-back. Hardaker had a controversial off-season in which he was fined by the club for his 'unprofessional' conduct prior to his withdrawal from the England World Cup squad. Peacock admits Hardaker has continued to be monitored closely by the Rhinos, but believes he has matured as a player. "He's been outstanding so far, I think he was probably on parole a little bit with his behaviour, but he has really grown as a leader and developed into a fantastic player," said Peacock. Castleford Tigers boss Daryl Powell, who coached Hardaker at Championship club Featherstone earlier in his career, believes the 22-year-old is capable of displacing Sam Tomkins as England's first-choice full-back. "He's a special player," said Powell. "He's got so much pace, he has instincts as a rugby league player. "He has so much going for him that he really will challenge Sam for the number one spot."